It's not much of a big deal to save WhatsApp status of your contacts on your phone. Some few years back, this looked much like a difficult task to achieve. But, that is now overcome, and you can download or save statuses you prefer. WhatsApp has taken the social media by storm and now command tremendous followership. There are over 1 billion accounts running every day on WhatsApp. Given the short span, this SM platform has been around, that's an excellent growth rate. Virtually every smartphone user desires this app to be working perfectly. Sometimes you wonder why. There are quite a number of reasons. First, it's completely free to download and activate. Also, its simplicity means you need no special skills to use it. It's completely flexible. Additionally, you can express your feelings with quick status(es) that expire after 24 hours. Downloading the status of other users is now the tricky task you are definitely interested in. But let me ask, why do you need to download others' statuses? Ok, I get it! Sometimes, they upload interesting, inspirational, meaningful, funny and refreshing updates. So, you want to either have this and reflect on, or simply share with others on your contact. Similarly, you might simply update your status with one of those you downloaded from your friend. That's the thing! save the status and use it to keep the fun going. Isn't that cool? Yeah, it is. But another question. Do you know how to save WhatsApp status of your friends and contacts? If you answered yes, thumbs up! But wait! How many methods do you know? 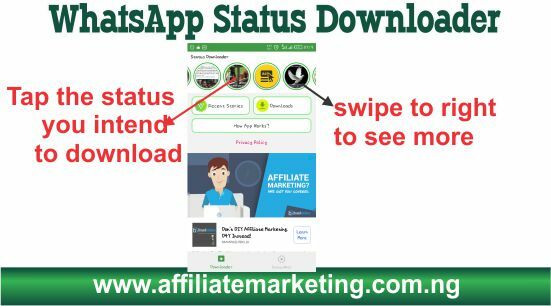 I believe not just one or the third-party app - WhatsApp Status Downloader. Otherwise, you might somehow want to read this guide to know another method to do so. If you do not know how to save WhatsApp status to your phone at all, then get on the ride. 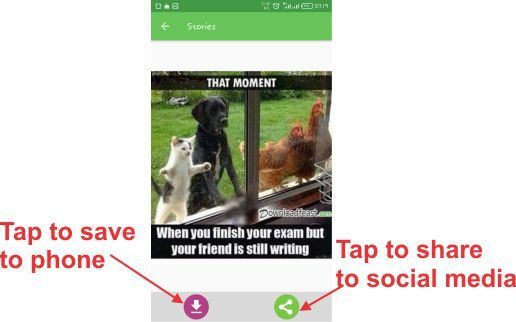 I will describe two tested approaches to download or save WhatsApp status of your friends to your phone. There are 2 reliable ways of doing this, but your phone must be WhatsApp compliant. Also, you need a File Manager app to navigate to directories on your phone. You can download WhatsApp from an App store or website directly. Then look up for a file manager, download and install on your phone. Once you have these two features working, it's time to ride. WhatsApp saves statuses temporarily on your phone for 24 hours. After that, the status - images, animations or videos - are deleted automatically. To prevent this from happening, you simply need to move the preferred status to a different folder on your phone. Do this before the expiration time. By moving the status to a different folder on your phone, WhatsApp would not be able to automatically delete the files you have moved. Firstly, view the status on WhatsApp so that you can save it on your phone temporarily. 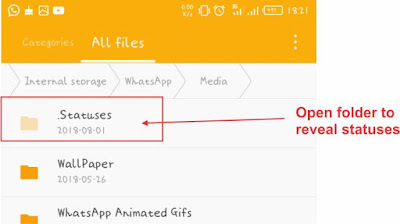 Open a File Manager and move to WhatsApp, then Media folder. This folder, by default, is usually found on the Internal Storage. Open the .Statuses folder to reveal all the available statuses not yet deleted. 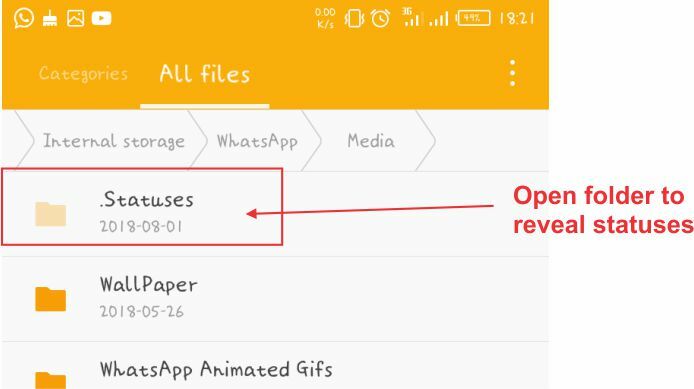 Now, copy the ones you desire and save in a different folder, preferably outside the WhatsApp folder. You can now reuse this as your status or simply share with some of your contacts. 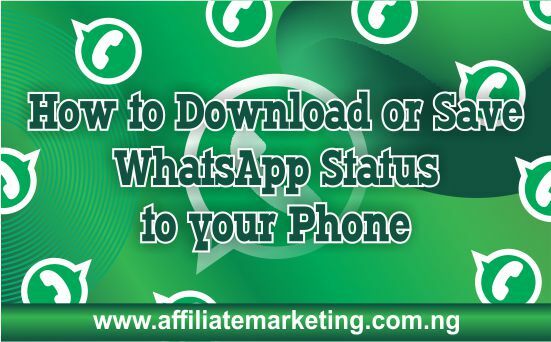 This method uses a third-party app to download or save WhatsApp status to your phone. You can search for WhatsApp status downloader on your favourite app store. Download and install the app. Next, launch the app and click Start to open the default app window. At the top, scroll left or right to view active statuses. Tap on the status you want to download or save. On the window that opens, click Download or Share. 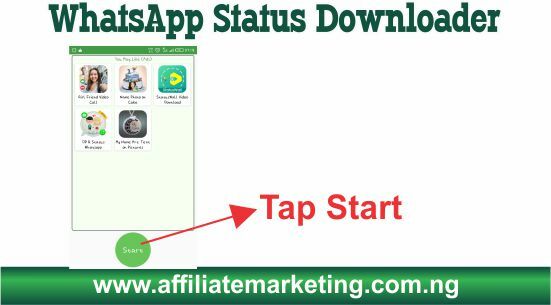 Tapping Download will save the status to your phone, while Share opens up several social media platforms to upload the status. To view the downloaded files, use a File manager and navigate to Internal Storage, then Status Downloader for WhatsApp. There, you will find all the statuses you have downloaded using this third-party app. You thought it was going to be tricky to achieve, but I'm glad you've seen how easy you can download or save WhatsApp status. But let me be directly to say that you need the permission of some of your friends to share or use their pictures on your status. Avoid infringing on the privacy of others. Ok, ride on and keep downloading statuses to spread the fun and love. I'm glad you found this useful. Hello, my name is Emmanuel Joshua. I'm an addicted blogger interested in mobile gadgets and devices.